SHEPL strives to exceed customer’s satisfaction in the field of diving services for Subsea & Underwater Surveys, Inspections, Non - Destructive Testing and Repairs of Ships, Platforms & Installations conforming to international standards, rules and regulations, to which the company subscribes. This is done through periodic review’s & continual improvement of the management system and ensuring safe and healthy working condition’s to the divers by periodically upgrading human resources, infrastructure and adopting world class practices. SHEPL is committed to protect the environment through preventive pollution and minimizing consumption of natural resources. SHEPL is also committed to ensure that security of clients, employees, contractors, subcontractors, infrastructures, assets, documents and sensitive information are adequately protected. SHEPL is committed to achieve the highest standards of performance while providing injury free, environmentally sound, reliable & cost effective diving services through its skilled manpower, managerial, technical & operational excellence. 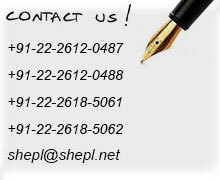 SHEPL’s vision is to be the leading Diving services provider in India comparable to the best internationally.